Catharus thrush (Hermit, Swainson’s, Veery, Bicknell’s, and Gray-cheeked) identification can be quite a challenge. I have uploaded some reference photos of Catharus thrushes, and included discussion of some of the critical plumage details and identifying characteristics for each species. 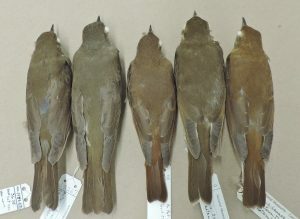 Figure 1: Catharus thrushes, from L to R: Bicknell’s, Gray-cheeked, Swainson’s, Hermit, and Veery. Figure 2: Upperpart colouration of Catharus thrushes, from L to R: Bicknell’s, Gray-cheeked, Hermit, Swainson’s, and Veery. In general, Bicknell’s and Gray-cheeked are grayish (Gray-cheeked) to grayish brown (Bicknell’s) throughout the face and showcase thin, partial eye-rings. Swainson’s showcases a bold, thick, buffy eye ring, “spectacles,” and a buffy wash throughout the cheek and throat. Hermit Thrushes showcase a thin, complete eye ring and often show some buffy wash throughout the lores and cheek, too. However, the buffy tones are usually less extensive and split by a dark region between the lores and the eye-ring (Lane & Jaramillo 2000a). With Veery, the reddish suffusion throughout, pale loral patch (the area between eye and base of bill), thin eye ring, and rear eye crescent offers a distinct and “soft” expression. Breast spotting is highly variable (intensity and degree of) within species (M. Gosselin, pers. comm., 30 April 2015) and, as such, only averages are mentioned. Bicknell’s and Gray-cheeked typically showcase bold, deep brownish spots. Swainson’s usually showcase an extensive buffy wash throughout the breast, overlain by extensive spotting. The breast spots tend to be more circular than Bicknell’s or Gray-cheeked but weaker and smaller than on a Hermit Thrush (Lane & Jaramillo 2000b). Hermit Thrush average extensive blackish spotting composed of comparatively large spots, though the amount of spotting varies individually, with some individuals being rather weakly spotted (Lane & Jaramillo, 2000b). Veeries are typically extensively washed with buff throughout the throat and breast and showcase light, weak spotting. Bicknell’s and Gray-cheeked showcase olive-brown (Bicknell’s) and olive (Gray-cheeked) flank coloration (Sibley 2014). The olive coloration throughout the flanks of some aliciae Gray-cheeked Thrushes can sometimes be cold, “battleship gray” in coloration (M. Gosselin, pers. comm., 30 April 2015). Swainson’s Thrush tends toward intensely olive tones throughout the flanks and showcase limited contrast between the flanks and the folded wing (Lane & Jaramillo 2000b). Hermit Thrush showcases buffy brown flanks of which, like Swainson’s, contrast weakly with the folded wing (Lane & Jaramillo 2000a). Veery showcase whitish to whitish gray flanks which contrast quite starkly with the reddish tones of the folded wing (Lane & Jaramillo 2000b). 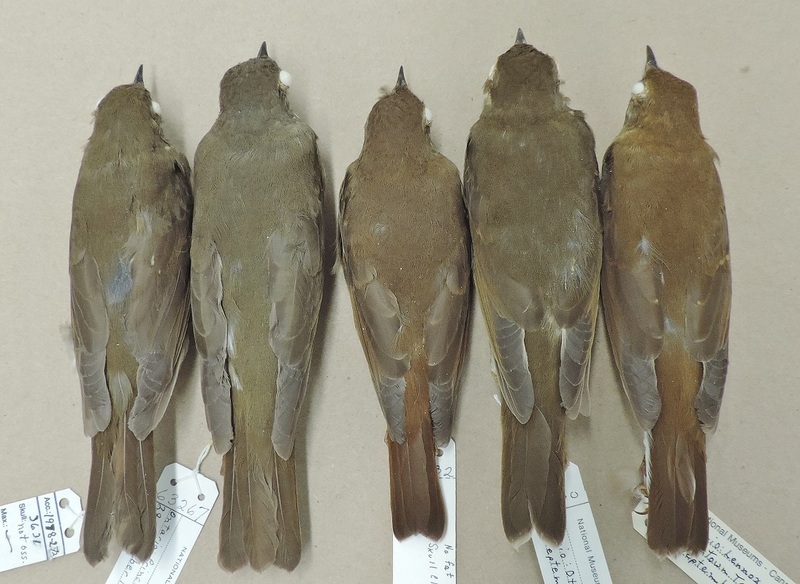 Bicknell’s average “warmer” in tone compared to Gray-cheeked with some individuals showcasing a deep reddish-brown throughout, with a slightly contrastive chestnut tail, similar to Hermit Thrush (Mclaren 1995). Gray-cheeked (C. m. aliciae) are cold grayish brown throughout. Hermit Thrush tends to be quite light reddish-brown throughout and showcase a distinctly contrastive reddish rump and tail. Swainson’s (barring “Russet-back” Swainson’s) are olivaceous and concolorous throughout their upperparts. Veeries average distinctly more reddish throughout compared to other Catharus thrushes. I thank Michel Gosselin of the Canadian Museum of Nature for kindly granting me access to the study skins in the museum collections facility. Lane, D. and A. Jaramillo. 2000a. Field identification of Hylocichla/CatharusThrushes. Part I: Molt and ageing of spotted thrushes and field ID of Wood Thrush and Hermit Thrush. Birding32: 121-135. Lane, D. and A. Jaramillo. 2000b. Field identification of Hylocichla/Catharus Thrushes. Part II: Veery and Swainson’s Thrush. Birding32: 242-254. Lane, D. and A. Jaramillo. 2000c. Field identification of Hylocichla/Catharus Thrushes. Part III: Gray-cheeked and Bicknell’s Thrushes. Birding 32: 318-331.